Bounce Coconut and Macadamia Protein Bliss is a creamy, dreamy way to snack healthily. With a rich blend of raw macadamias and cashews, exotic coconut, and two kinds of high quality whey protein, this healthy snack will give you a source of protein and fibre between meals. Blue Agave Syrup, Inulin (Dietary Fibre), Cashews (12%), Whey Protein Isolate (from Milk) (11%), Coconut (8%), Whey Protein Concentrate (from Milk) (7%), Rice Bran, Brown Rice Flour, Macadamias (6%), Stabiliser (Guar Gum), Tapioca Starch, Flavourings, Whey Protein Hydrolysate (from Milk) (1.5%), Safflower Oil, Vanilla Extract, Sea Salt, Antioxidant (Natural Mixed Tocopherols), Sesame Seeds, Stabiliser (Calcium Carbonate), Emulsifier (Sunflower Lecithin). 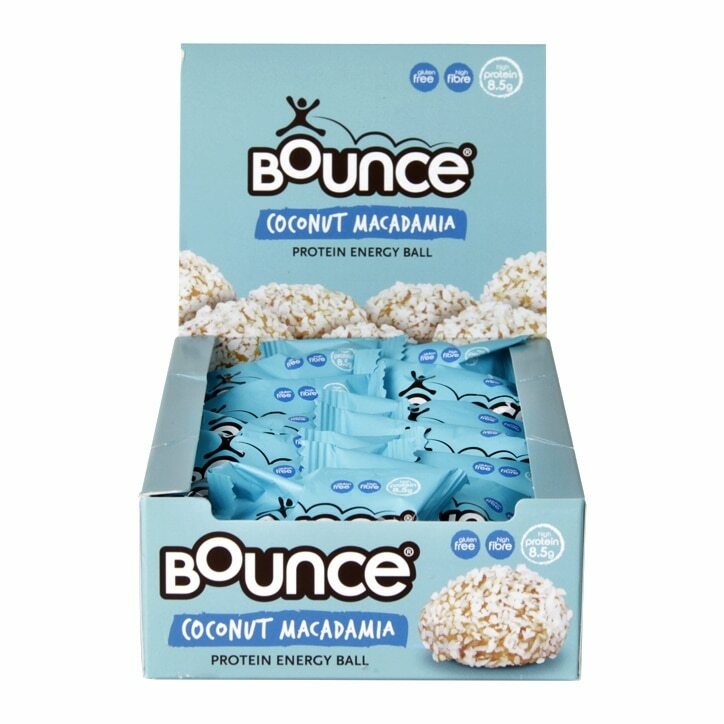 Bounce Coconut & Macadamia Protein Ball is rated 4.6 out of 5 by 27. Rated 4 out of 5 by Tinky05 from Lovely little balls I tried this a couple of days ago and it is lovely! I am not usually a huge coconut fan but this flavour looked lovely. Very delicious, it was bigger than I thought and quite tasty. Would definitely buy again. The only down side is that is yeah they’re a little expensive!